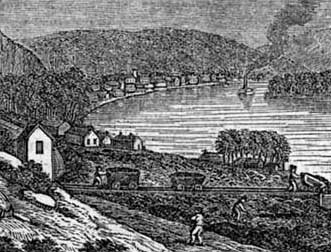 The first European settlers in Ohio recognized the presence of coal in natural outcrops in stream and river banks in the eastern part of the state. As the industrial revolution began, Ohio�s coal resources became increasingly important. One of the primary objectives of the first Geological Survey of Ohio in 1837-1838 was to survey the mineral resources of the state, particularly coal. Soon, coal was being mined as a fuel to heat homes and businesses. Development of the Ohio canal system in the 1830�s and 1840�s permitted easy transport of coal from mines to markets. By the mid 1800�s, railroads began to replace the canals, allowing for faster and more efficient delivery of coal to consumers. By the late 1800�s, mechanization and improvement of mining methods led to a steady increase in the production of Ohio coal. Much coal was used to make coke to fuel the many steel mills that dotted the upper Ohio River valley. Eventually, coal became the primary source of energy to generate electricity and the dominant underground mines were replaced by surface strip mines, where large amounts of overlying rock was removed by massive shovels and draglines to get access to the valuable coal seam. Currently, there are about 90 active coal-mining operations in 15 eastern Ohio counties that produce coal worth about $626 million annually. In recent years there has been a trend to return to underground-mining methods, particularly long-wall mining. With this technique, almost all of the coal is recovered for sale in contrast to the older room-and-pillar method where up to half the coal remained in the ground to support the roof of the mine. The leading coal-producing counties in decreasing order are Belmont, Harrison, Tuscarawas, Athens, and Jefferson. Although there are about 50 named coal beds or seams in Ohio, only a few are of sufficient thickness and extent to be mined. Most production comes from the Pittsburgh (No.8) coal seam. Coal formed in Ohio during the Pennsylvanian Period about 300 million years ago when the state was near the equator with a warm climate. Eastern Ohio was a low-lying coastal area that was crossed by delta-building streams from the rising Appalachian Mountains to the east. Vast swamps with lush vegetation dominated the coastal areas. As the vegetation died and fell into the oxygen-poor waters of the swamps, it became thick layers of peat that eventually were compressed and buried under shale and sandstone as rivers switched course. As more rock accumulated above the swamp vegetation, it became compressed and altered first to lignite, or brown coal, and eventually to bituminous coal.